Women’s basketball’s season came to a devastating end at the hands of Mississippi State in overtime, 73-63. The Cardinals had a chance to win at the end of regulation, but the two attempts at the rim just missed. After a painful end to a historic season, Louisville must now move on. Coach Jeff Walz points to the big picture when it comes to the loss. “Athletics: Sometimes there’s good, and sometimes there’s bad. You can’t let one game define you as a person or define your season,” Walz said. As expected, the Louisville locker room was filled with emotion. Walz harped all year about the character of his team. The players showed their class, fielding any and all questions after their crushing loss. Louisville’s leading scorer entered the press conference far from the normal, smiling and joke-cracking self. Defeated, Durr’s shoulders slumped as reporters slung questions across the four-person panel. Somehow, Durr seemingly went unnoticed throughout the press conference — until the end. “Question for Asia,” a reporter said. The junior snapped out of mourning and sat tall. And just like that, the emotions hit Durr like a truck. “I’m sorry. I can’t talk,” Durr said. She gathered herself and shared her thoughts on one of the best friends and now former teammate. “When I first got here, she did so much for me. My first year here was so hard for me. She’s the one who brought me through, took me underneath her wing,” Durr said. Durr looked at the highlights of the season in the locker room. “We made history … we’ve done a lot of great this year. This loss does not take away from what we did,” Durr said. 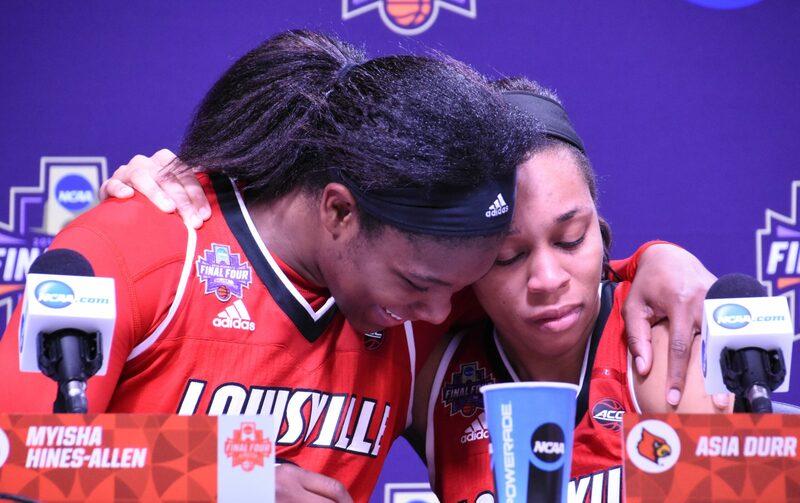 The team’s lone senior walked into her final press conference as a Louisville Cardinal with tears in her eyes. The first question to Hines-Allen pertained to the shot that sent the game into overtime. Hines-Allen said she hoped it didn’t go in so Louisville would have won. Then in an act of class, she praised Mississippi State’s Roshunda Johnson and the Bulldogs. Hines-Allen took the opportunity to talk about Durr after the game. The sophomore from Florida had one of the best games of her career on the biggest stage she’s ever been on. In 40 minutes, she recorded 15 points (7-of-9) and nine rebounds. Staying to together was the biggest thing to Jones. Fuehring only had two points, but had one of the games biggest moments late in the fourth quarter. The junior was called for her fourth foul while boxing. Unhappy with the call, she slapped the floor to release her frustration. Her reaction garnered a technical, sitting her down for the rest of the game. Evans helped carry Louisville during the second quarter, preventing Mississippi State from running away from the game. The freshman had nine points and four rebounds in the contest. She earned All-ACC Freshman honors, but doesn’t take the credit for herself. Love you Cardinal LADIES. Have known your wonderful coach since his young childhood. His family represents fantastic athletes with fine character. So nice to see it follow through to you gals. We learn by our mistakes- it makes us stronger people. Looking forward to next season. Now men’s and women will be coached by 2 GRAETER CINCINNATI Men with outstanding male character. Go CARDS.